Jose is a well known Primitive Technology and Bushcraft instructor who has been actively teaching for years at all the major skills gatherings in the West, such as Rabbitstick, Wintercount, Saskatoon Circle, Buckeye, Echoes in Time, Oregon Country Fair, etc. His approach is unique in the sense that it combines Military Tactical skills as well as timeless Wilderness Living knowledge gathered during years of traveling and studying with Elders and senior instructors in the field, both Native American and Native European. In his younger years, he earned his Green Beret in the Special Operations Group of the Spanish Foreign Legion, (B.O.E.L. ), and worked for a few years as a bodyguard in the Security Service of the Spanish Royal House, “sporting a suit and a silk tie in a lot of fancy places while I’d rather be in the bush”. In ’99, he decided to completely change his lifestyle and begun a series of journeys pursuing his long-time dream of a life of intimate connection with Nature. After loosing his sailboat in a shipwreck in the Amazon in ’05 he began spending more and more time at his cabin in the Yukon Territory in Northwest Canada, a place he was drawn to because he had a “Jack London overdose as a kid”. Over the years, his teaching has evolved to center around the concept of “Re-Indigenization”, which combines practical skills knowledge with re establishing emotional ties to the Land and expanding awareness and instinctual growth, as well as experimenting with workshops on different historical timelines, from Stone Age thru Medieval Technology to Modern Bushcraft. 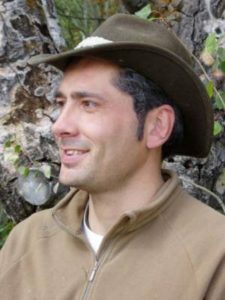 Jose is a at the moment a full-time resident of the Yukon, and still travels and teaches extensively pursuing his varied interests, which include, besides Bushcraft, Medieval Full Contact Fighting. He is the founder and trainer of the Company of the White Wolf, a group of enthusiasts dedicated to the practice and preservation of the Knightly Martial Arts of medieval Europe, and competes regularly in this discipline on an international level. He is available for skills workshops and walkabouts in the Yukon and elsewhere.